If you have configurable products that have been associated with simple products, you can assign configurable products to related products. You probably know how this task can be boring. To avoid that (in most cases) boring task, I created this module so you don’t need to lose lots of your precious time. You probably know how to associate related products in Magento, but let’s repeat for those who forgot or maybe don’t know. Open Product_1 and assign Product_2, Product_3 and Product_4 as Related Products to Product_1. If you want to associate Product 2 to other (previously mentioned) Products 1, 3 and 4, you just follow the same procedure. If, perhaps, you don’t know what Related products, Up-sells or Cross-sells are, check out related Inchoo and/or Magento post. Those posts will certainly get you on the right track. To avoid this boring additional work, I’ve created Magento module that will automatically link all products in one step! Not only that, you can exclude some of the products from a list of products (if you wish to do that) in just one step, so that excluded product will not be anymore associated to other products from the list. One more thing, you can also upload CSV file with your product ID#, where each row represents collection of related products. Everything will be much easier to explain through examples, so let’s start! First things first, let’s explain configuration options. This configuration option will enable this enhancement to Magento Related Products functionality. This is the interesting one… Imagine that you have products 1, 2, 3 and 4 and you want to associate them as Related Products (in a way that all of them are associated to each other – “cross related”). To avoid boring additional work, you’ve enabled this module. You would go in Magento administration to Catalog/Manage Products. Then select Product 1 and then click on Related Products tab. After assigning products 2, 3 and 4, click on Save. And that’s it! If you select Product_2 you would see that products 1, 3 and 4 are all associated to Product_2. Similar is for products 3 and 4. Now, for this configuration option, let’s say that you don’t want anymore Product_4 to be associated to collection of products 1, 2 and 3. 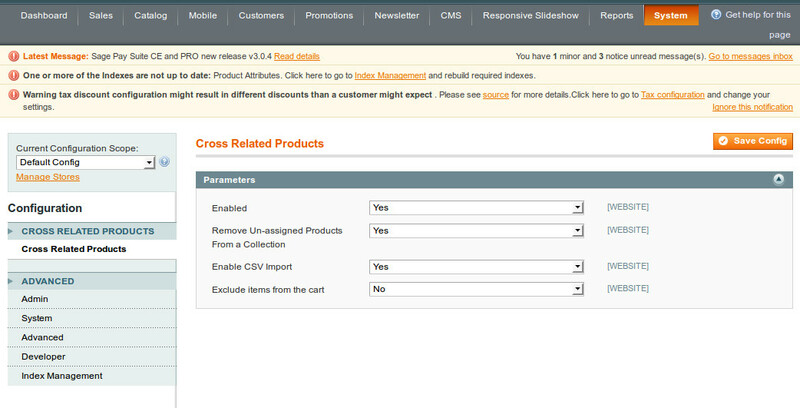 Normally, in default Magento functionality you would need to select Product_1 and un-select Product_4. Then you would select Product_2 and un-select Product_4. Same for Product_3. At the end, if you select Product_4 (which you want to exclude from your related collection of products 1, 2 and 3) you would see that Product_4 is connected to products 1, 2 and 3. Let’s come back to our example – Cross Related enhancement. Firstly, we’ve associated products 2,3,4 to Product_1. Then we un-selected Product_4 from specified collection, so each products: 1, 2 and 3 would be associated with each other. In default Magento behaviour, Product_4 would be associated with products 1, 2 and 3. To remove, also in one step, Product_4 to be associated to products 1, 2 and 3 (we have had connected products 1, 2, 3, 4) you can enable this configuration option and system will automatically unassigned all “irrelevant” products from specified collection. So basically, imaging that connecting on Product_1 products 2, 3, 4 is the same as you are sending one row in CSV file: “1”, “2”, “3”, “4”. As the result, all of those products would be assigned to each other. Same, if you send (with this configuration option) again in next row “1”, “2”, “3” as a result you’ll have products 1, 2 and 3 associated to each other, BUT product 4 will be “alone” – more precisely, Product 4 will not have anymore associated products 1, 2 and 3. You can now Browse your csv file and click on “Check Data” button to upload and check your csv file, after which you’ll see “Import” button, if you have at least 1 row for insert. 🙂 Otherwise you’ll see next message without Import button: “File is totally invalid. Please fix errors and re-upload file“. After you click on “Import”, you’ll see “Back” button so that you can re-upload some other file, if needed. Note. “Check” button will upload your file (on success) in [MAGENTO_ROOT]/var/crossrelated/crossrelated.csv and “Import” button will connect those items and delete the file. Now let see some snippets of the code. For full module you’ll need to download archive file from here. * Validates source file and returns validation result. * Import/Export working directory (source files, result files, lock files etc.). * Import & unlink checked crossrelated csv file. * Start validation process action. * Start import process action. Note. For full module you’ll need to download archive file from here. Feel free to create your own csv file with IDs of your desired products and let me know what do you think. If you have any questions… we are here for you! it seems zip file is corrupted.. can you upload it again. i’ve uploaded all the module but nothing change in the admin section. what’s wrong?